Miami Dolphins quarterback Ryan Tannehill faces an "uphill challenge" in his recovery from a shoulder injury and is unlikely to play next Thursday against the Houston Texans, according to a report by ESPN. 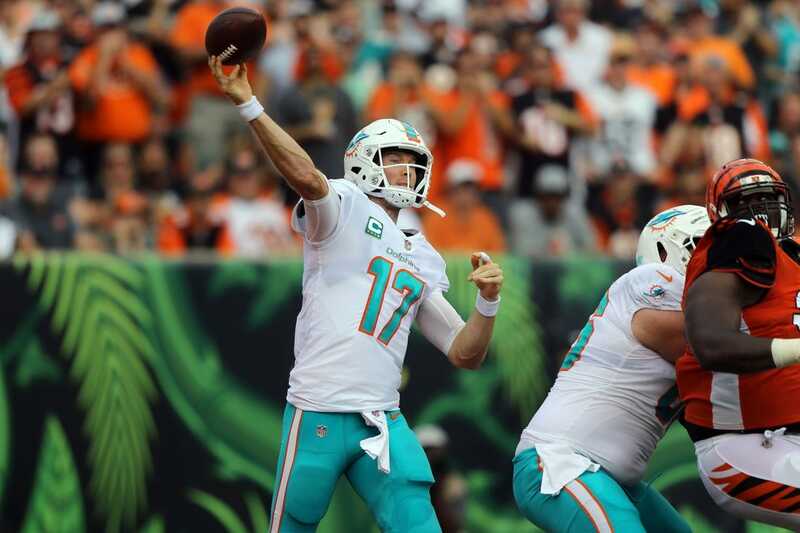 Tannehill was ruled out of Miami's Week 7 game against the Detroit Lions by coach Adam Gase on Wednesday. Tannehill did not throw during the open portion of Wednesday's practice, and backup Brock Osweiler, who started last Sunday's win over the Chicago Bears, took all of the first-team reps.
Gase told reporters Thursday that surgery is not on the table for Tannehill. "He could throw tomorrow if he wanted to," Gase said. "He probably wouldn't feel very good." Meanwhile, the NFL is investigating the team's handling of Tannehill's injury and how it was disclosed on injury reports last week, according to multiple reports. Such investigations are not uncommon, particularly when involving prominent players, but there is reason to believe the Dolphins' injury report last week was inaccurate. --Cleveland Browns cornerback E.J. Gaines entered the NFL's concussion protocol and will miss Sunday's road game against the Tampa Bay Buccaneers. The decision to place Gaines in concussion protocol was made when he showed up Thursday morning with symptoms, according to coach Hue Jackson, who added Gaines was not hurt in practice. Gaines had been starting in place of Terrance Mitchell (broken wrist). Jackson said T.J. Carrie likely will start opposite Denzel Ward against the Buccaneers, who have the No. 1 passing offense in the league. --The New York Giants signed former first-round draft pick Corey Coleman to the practice squad, the team announced. The wide receiver now is with his fourth team in three months. He worked out with the Giants on Wednesday. The Cleveland Browns selected the Baylor product with the 15th overall pick of the 2016 NFL Draft and traded him to Buffalo on Aug. 5 for a 2020 seventh-round draft pick. He was released less than a month later and had also been signed and released by the New England Patriots since.